Most of my public-facing advocacy efforts over the past couple of years have been focused on Bike-Walk Dunwoody, hence not too many posts on this blog of late. Every so often, I'm honored to have some good press coverage. Heaven knows that in my own community of Dunwoody, we have our "regulars" that adamantly oppose trails, bike lanes and the like. They repeatedly get letters to the editor published in our local free newspaper. Heck, at the last city council session I attended, a woman spoke up during public comments and called me "Her opponent". The prior council session, as I was speaking during public comments, she called out from the back of the chambers and interrupted me... Geez -- we have differing opinions and I respect that. But please don't take things so personally, Myself and many, many others would like our city to install bike lanes along the major east-west street that she lives on, Tilly Mill. She does not. And in so doing, has labeled me as her opponent. Feel free to checkout the below 3-minute video of the woman that lives in my hometown that does not want bike lanes on her street. She starts at minute 7:28. If you play the rest, you'll hear from nine other people that would like bike lanes and appreciate our city's continued investment in safe infrastructure for people to travel on foot or by bicycle. 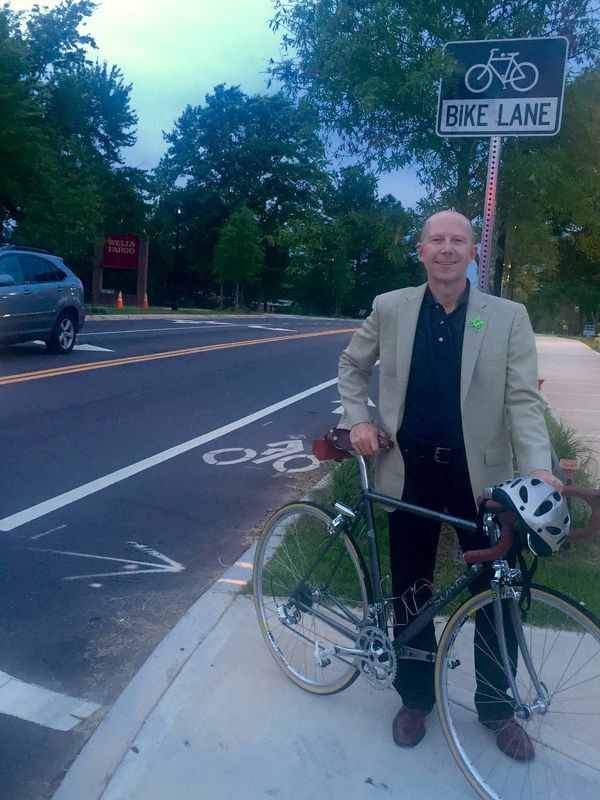 Anyway, on Sunday, June 13th the Atlanta Journal Constitution published a short Q&A in their Metro Section about my efforts with bicycling advocacy and Georgia Bikes entitled, "Sunday Conversation with Joe Seconder". Special thanks to reporter Ann Hardie for covering this. To read the on-line story, click here. About half the car trips we take are less than four miles from our home, says Joe Seconder, vice president of Georgia Bikes!, an advocacy group. If every now and then we grabbed a bike helmet instead of the keys, we would have less congestion on the roads and healthier kids and grownups. “I am never going to say, ‘Get cars off the road,’” says Seconder, a principal sales consultant with Oracle who lives in Dunwoody. “But at Georgia Bikes!, we want to give people a safe option.” The retired major in the U.S. Army Reserve talks about how the group’s efforts are helping frequent bicyclists like him and most of the rest of us who act like we’ve forgotten how to ride a bike. Q: How long have you been a cyclist? A: When my wife and I moved to Europe, I rediscovered the simple joy of riding a bicycle. I met other American ex-pat friends and we would ride on lovely trails. My wife and I even took a vacation on bikes in France. When we came back to Atlanta in 2007, I found local cycling clubs and I would get their maps. You could live in the same place for 10 years and never know about these back ways of getting around. Q: What is Georgia Bikes!? A: Simply put, we work to make it safer for people of all ages and abilities to ride a bike. We think about how the state, regions and municipalities can set up policies and laws and invest to build connected networks such as protected bike lanes and trails that offer vulnerable users of the roads a safer place to travel. Q: Why did you get involved with Georgia Bikes!? A: I decided to become engaged and collaborate to help Georgia be a safer place to ride a bike. I am going to say this a little bit selfishly, but a lot of the work I am doing is for my wife. She is not comfortable riding on a road with no bike lanes or shoulders. We are currently experiencing change with many cities and counties – and the state Department of Transportation – providing safer engineering and complete streets that include bike accommodation. Q: What has Georgia Bikes! accomplished? A: We now get the funding through the sales of license tags that say, Share The Road. We have been able to hire our first ever full-time executive director to conduct outreach education around the state and talk to transportation planners, engineers and elected officials about how roads and networks can be redesigned to provide safe choices for people on bikes. A major milestone was passage of a 3-feet safe passing law, which requires cars to allow adequate space when passing a person riding a bicycle. Q: What would you recommend for people just getting back on a bike? A: Go to your locally owned bike shop. Make sure your bike fits you, works properly and that you have a helmet. Talk to them about where you can ride in the area. Find out if they offer introductory group bike riding or clinics. If you are closer to town, the Atlanta Bicycle Coalition offers classes and will help people get back on the bike. Q: Where are your favorite places to bike in Georgia? A: I love to go riding in ‘the Gaps” in North Georgia, between Dahlonega and Helen. The mountains are beautiful, physical, challenging and very rewarding. My other shout out would be any of the PATH Foundation trails. The Arabia Mountain Trail is 22 winding miles through woods and lakes. I love riding right here in Dunwoody. It’s a sweet spot of riding conditions.